As a hybrid machine built for high performance this series reduces production costs by maximizing electric and hydraulic technologies. Sumitomo’s new SE-HY Series accumulator-assisted, hybrid-electric injection molding machines are designed for packaging and other ultra-high-speed, high-productivity applications. Available in 385 and 495 US ton models, the SE-HY uses three, Sumitomo-built, AC servo motors with digital-to-digital, full closed-loop control for plasticizing, clamping and ejection. Accumulator-assisted hydraulics, with a digital servo valve and full closed-loop control, are employed for injection unit displacement, injection, hold pressure, back pressure and screw pull back. The SE-HY delivers a level of precision and repeatability in which the set points and actual values are virtually indistinguishable from each other. Results for shot weight accuracy and repeatability yield a typical deviation-to-mean ratio of less than 0.02%. The field-proven double toggle design, also used in Sumitomo’s SGM, SES and SED machines, ensures years of trouble-free, high-speed operation. Plus the SE-HY features low-vibration, fast, smooth mold open/close, precision mold protection and the ability to optimize cycle times with selectable ramping modes. The field-proven, N-7 full-color control is another productivity plus. From easy, prompted setup to full QC and SPC capabilities, the N-VII is known for building operator confidence and improving quality ratings. 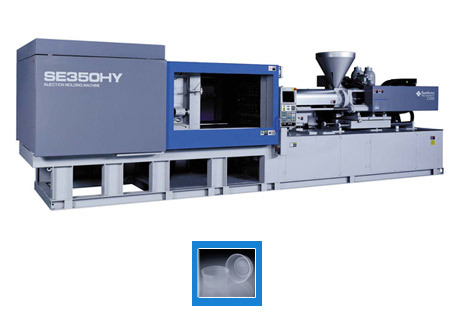 SE-HY ultra-high-speed hybrid electric injection molding machines are backed by Sumitomo Plastics Machinery’s comprehensive Customer Satisfaction Program. It’s the peace of mind that comes with ISO 9001 certified manufacturing, the industry’s best warranty program, worry-free parts, responsive field service and financing availability — plus the other important advantages of Sumitomo training and processing assistance that help ensure optimum machine performance. Please use the SE-HY Info buttons above at right to read more about SE-HY Series ultra-high-speed hybrid injection molding machines.